There are lots of different basic data structures in R. If you take any kind of longer introduction to R you’ll probably learn about arrays, lists, matrices, etc. Let’s skip straight to the data structure you’ll probably use most – the data frame. We use data frames to store heterogeneous tabular data in R: tabular, meaning that individuals or observations are typically represented in rows, while variables or features are represented as columns; heterogeneous, meaning that columns/features/variables can be different classes (on variable, e.g. age, can be numeric, while another, e.g., cause of death, can be text). This lesson assumes a basic familiarity with R.
Recommended reading: Review the Introduction (10.1) and Tibbles vs. data.frame (10.3) sections of the R for Data Science book. We will initially be using the read_* functions from the readr package. These functions load data into a tibble instead of R’s traditional data.frame. Tibbles are data frames, but they tweak some older behaviors to make life a little easier. These sections explain the few key small differences between traditional data.frames and tibbles. You can download the cleaned up version of the data at the link above. The file is called brauer2007_tidy.csv. Later on we’ll actually start with the original raw data (minimally processed) and manipulate it so that we can make it more amenable for analysis. There are some built-in functions for reading in data in text files. These functions are read-dot-something – for example, read.csv() reads in comma-delimited text data; read.delim() reads in tab-delimited text, etc. We’re going to read in data a little bit differently here using the readr package. When you load the readr package, you’ll have access to very similar looking functions, named read-underscore-something – e.g., read_csv(). You have to have the readr package installed to access these functions. Compared to the base functions, they’re much faster, they’re good at guessing the types of data in the columns, they don’t do some of the other silly things that the base functions do. We’re going to use another package later on called dplyr, and if you have the dplyr package loaded as well, and you read in the data with readr, the data will display nicely. First let’s load those packages. If you see a warning that looks like this: Error in library(packageName) : there is no package called 'packageName', then you don’t have the package installed correctly. See the setup page. Now, let’s actually load the data. You can get help for the import function with ?read_csv. When we load data we assign it to a variable just like any other, and we can choose a name for that data. Since we’re going to be referring to this data a lot, let’s give it a short easy name to type. I’m going to call it ydat. Once we’ve loaded it we can type the name of the object itself (ydat) to see it printed to the screen. Take a look at that output. The nice thing about loading dplyr and reading in data with readr is that data frames are displayed in a much more friendly way. This dataset has nearly 200,000 rows and 7 columns. When you import data this way and try to display the object in the console, instead of trying to display all 200,000 rows, you’ll only see about 10 by default. Also, if you have so many columns that the data would wrap off the edge of your screen, those columns will not be displayed, but you’ll see at the bottom of the output which, if any, columns were hidden from view. If you want to see the whole dataset, there are two ways to do this. First, you can click on the name of the data.frame in the Environment panel in RStudio. Or you could use the View() function (with a capital V). There are several built-in functions that are useful for working with data frames. ##  "symbol"          "systematic_name" "nutrient"        "rate"
The glimpse() function is available once you load the dplyr library, and it’s like str() but its display is a little bit better. The skimr package has a nice function, skim, that provides summary statistics the user can skim quickly to understand your data. You can install it with install.packages("skimr") if you don’t have it already. We can access individual variables within a data frame using the $ operator, e.g., mydataframe$specificVariable. Let’s print out all the gene names in the data. 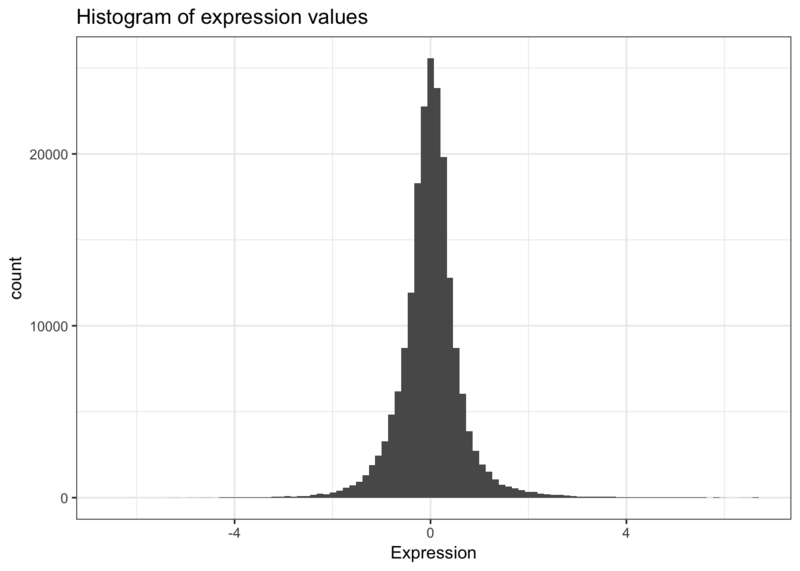 Then let’s calculate the average expression across all conditions, all genes (using the built-in mean() function). ##    "SFB2"     NA         "QRI7"     "CFT2"     "SSO2"     "PSP2"
##    "RIB2"     "VMA13"    "EDC3"     "VPS5"     NA         "AMN1"
##   "SCW11"    "DSE2"     "COX15"    "SPE1"     "MTF1"     "KSS1"
##   NA         NA         "YAP7"     NA         "YVC1"     "CDC40"
##   NA         "RMD1"     "PCL6"     "AI4"      "GGC1"     "SUL1"
##   "RAD57"    NA         "PER1"     "YHC3"     "SGE1"     "HNM1"
##   "SFL1"     "OYE3"     "MMP1"     "MHT1"     "SUL2"     "IPP1"
##   "CWP1"     "SNF11"    "PEX25"    "ELO1"     NA         "CDC13"
##   "FKH1"     "SWD1"     NA         "HOF1"     "HOC1"     "BNI5"
##   "CSN12"    "PGS1"     "MLP2"     "HRP1"     NA         "SEC39"
##   "ECM31"    NA         NA         "ADE4"     "ABC1"     "DLD2"
##   "MRPL16"   NA         NA         NA         NA         "AI3"
##   "COX1"     NA         "VAR1"     "COX3"     "COX2"     "AI5_BETA"
##   NA         "PRP46"    "XDJ1"     "SLG1"     "MAM3"     "AEP1"
##  "UGO1"     NA         "RSC2"     "YAP1801"  "ZPR1"     "BCD1"
##  "UBP10"    "SLD3"     "RLF2"     "LRO1"     NA         "ITR2"
##  "ABP140"   "STT3"     "PTC2"     "STE20"    "HRD3"     "CWH43"
##  "ASK10"    "MPE1"     "SWC3"     "TSA1"     "ADE17"    "GFD2"
##  "PXR1"     NA         "BUD14"    "AUS1"     "NHX1"     "NTE1"
##  NA         "KIN3"     "BUD4"     "SLI15"    "PMT4"     "AVT5"
##  "CHS2"     "GPI13"    "KAP95"    "EFT2"     "EFT1"     "GAS1"
##  "CYK3"     "COQ2"     "PSD1"     NA         "PAC1"     "SUR7"
##  "RAX1"     "DFM1"     "RBD2"     NA         "YIP4"     "SRB2"
##  "HOL1"     "MEP3"     NA         "FEN2"     NA         "RFT1"
##  "CPT1"     "ERV29"    "SFK1"     NA         "SEC20"    "TIR4"
##  NA         NA         "ARC35"    "SOL1"     "BIO2"     "ASC1"
##  "RBG1"     "PTC4"     NA         "OXA1"     "SIT4"     "PUB1"
##  "FPR4"     "FUN12"    "DPH2"     "DPS1"     "DLD1"     "ASN2"
##  "TRM9"     "DED81"    "SRM1"     "SAM50"    "POP2"     "FAA4"
We might be interested in the average expression of genes with a particular biological function, and how that changes over different growth rates restricted by particular nutrients. This is the kind of thing we’re going to do in the next section. What’s the standard deviation expression (hint: get help on the sd function with ?sd). What’s the range of rate represented in the data? (hint: range()). What if we wanted show the mean expression, standard deviation, and correlation between growth rate and expression, separately for each limiting nutrient, separately for each gene, for all genes involved in the leucine biosynthesis pathway? Neat eh? We’ll learn how to do that in the advanced manipulation with dplyr lesson.